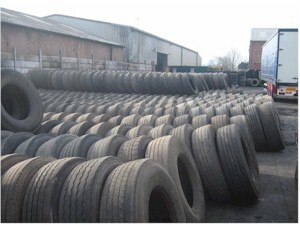 A L Tyres are a local family business located in Stockport and have been involved in buying and selling truck tyres and casings for over 40 years. A L Tyres as a business was started in Stockport town centre in the early 1970s by Adrian Lowth. It has been on the current site for over 15 years. A L Tyres is still run by Adrian but now with the help of his two sons Simon and Matthew, and recently his grandson William. +44 (0)161 477 5813, or drop in and visit us in Stockport. Simon Lowth joined the family business about 15 years ago. At present Simon is responsible for the buying and selling side of the business and for ensuring customer satisfaction, that is A L Tyres' customers get the best tyres for the best price. In one respect Simon hasn't followed in his father's footsteps, because on alternate Saturday afternoons he'll be at Maine Road watching City. Matthew Lowth joined A L Tyres about 10 years ago. Matthew is responsible for the logistics of getting people, trucks and tyres together in an efficient coordinated way. Matthew also has a season ticket for United. William Lowth is the latest family member to join the business. William is third generation Lowth and hoping to vitalise the business.